Crime solving duos are not entirely unknown in the world of mystery fiction, but Agatha Christie is most known for her two solitary sleuths: Hercule Poirot and Miss Marple. She did, however, write quite a few mysteries featuring the married duo Tommy and Tuppence Beresford. 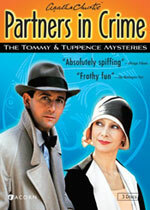 In Partners in Crime: the Tommy & Tuppence Mysteries, we get to see the detecting pair in action. This incarnation of the pair stars Francesca Annis as Tuppence and James Warwick as Tommy. The series begins soon after the end of World War I. Tommy Beresford and Tuppence Cowley are childhood friends who came across each other during the war when he was wounded and sent to a hospital and she was a nurse. They have re-connected after the war, but while they have feelings for each other, at the beginning both insist their relationship is merely friendship. Both are at a loss for employment after the war, and both complain of poverty (although this doesn't stop them, Tuppence in particular, from having a fantastic wardrobe; "poverty" must be a subjective term here!). They begin their search for interesting, and hopefully lucrative, employment by placing an ad in the local newspaper offering their services to "go anywhere" and "do anything" as long as the pay is good. Naturally, an interesting offer comes in right away. Tuppence is granted an interview with a man who offers her good pay to travel with him to Paris as his ward and investigate a finishing school. She's more than happy to accept, but when she turns up the next day at his office, she's distressed to learn he "closed up" his business and has left no forwarding address. With what little they know, she and Tommy set out to solve the mystery. They end up involved with government ministers, shadowy foreign figures, an American millionaire and a mysterious Mr. Brown. After that case is wrapped up, the pair declare their mutual admiration for each other and decide to get married. Fortunately, Tommy's uncle decides to give him "an allowance" so that money problems seem to be a thing of the past for the young couple. They are also approached with an offer to take over a business, the International Detective Agency, as the former owner, a Mr. Blunt, is going to be spending some time behind bars. 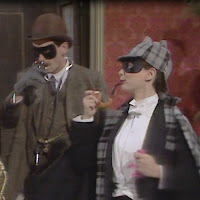 It is suggested that since Mr. Blunt has established an identity as a detective, that no one in the public needs to be informed that a new "Mr. Blunt" is taking over the business. So Tommy assumes the roll of Mr. Blunt, and Tuppence becomes his secretary/assistant, Miss Robinson. Their first case is something of a plant, as Tuppence conspires with a friend to arrange a missing person case for the agency to investigate. This garners them word of mouth publicity, in addition to the occasional newspaper ad advertising their services. They are soon investigating missing jewels, a possible haunted house, murders and poisonings. 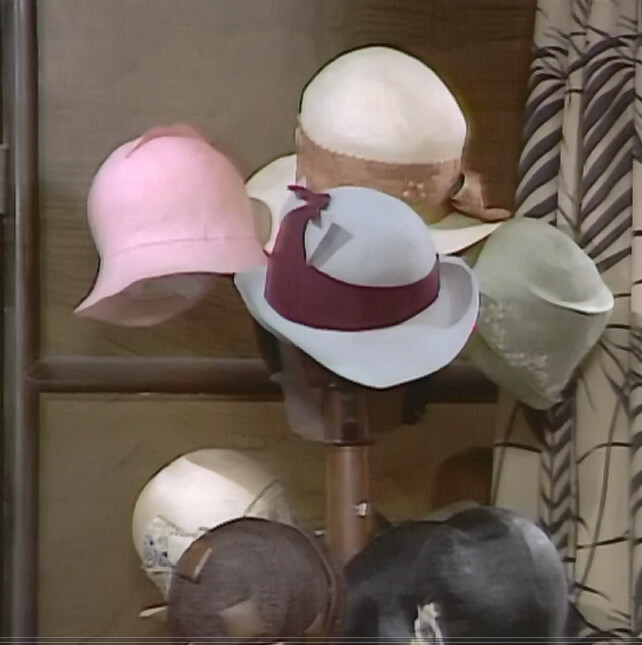 Through it all, Tuppence exhibits her love of sometimes outrageous hats and Tommy indulges her shopping habit. is all you need to fool the criminals! I was surprised to see an appearance in one episode by Lynda La Plante, the author of the Prime Suspect mystery series. I had no idea that she had started her career as an actress. She does a quite passable American accent in her role as a spoiled wife who carelessly mislays her expensive pink pearl. This set includes 11 episodes on 3 DVDs. The episodes were originally shown on PBS's Mystery and were filmed in the 1980s. This set also includes SDH subtitles, which are always useful! In typical Christie fashion, most of the action seems to center around the upper-classes: fabulous clothes, expensive cars and stately homes feature prominently. The characters also direct phrases at each other like "old thing" and "old bean" -- and these are apparently terms of endearment! I really enjoyed seeing these episodes and learning more about Christie's married detective duo. 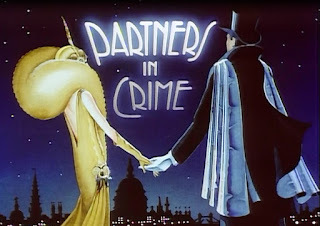 Disclaimer: I received a copy of Partners in Crime from Acorn Media.